It is the organizations offers comprehensive range of CAD training and services to Design, Drafting & Engineering Manufacturing & Consultancy organization. CADD-E Solutions is reputed for its strong all round technical expertise, efficient support & customer care. 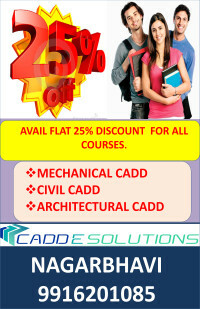 It also offers exclusive courses designed for Mechanical / Architecture / Civil. Engineers enabling them to quickly and easily master CAD / CAM / CAE. Our courses are based on experience and we are confident that these training courses can quickly help you excel. This entry was posted in Blogposts, Offers. Bookmark the permalink.